It’s finally here, our final review of the Springfield Armory Range Officer 9mm 1911. Let’s first start off with the scoring system, which to refresh your memory starts all guns with a maximum score of 100 points, then deducts points as various things go wrong. The Range Officer had 7 failures that were counted against the gun, lowering the score to 93. It also failed the 10-8 Performance function test, dropping the score to 83. Finally, it had one armorer level repair issue, namely that the rear sight pin would walk out of the rear sight under sustained rapid fire. That gives us a final score of 78/100, making this a solid C+ gun. What’s interesting about the tests is that while the Springfield did out-perform the Taurus, it didn’t do it by nearly the margin I thought it would. The RO costs as near as makes no difference 250 dollars more at retail than the Taurus, but I honestly didn’t see $250 worth of performance increase. Yes, the RO was more reliable, and yes it was more accurate to shoot groups with, but the RO brand new is a $750-$800 gun, and the Taurus is a $500 gun. If the RO had finished in the mid to high 80s, which is where I expected it to finish, we wouldn’t be having this conversation, because $750 is a perfectly reasonable price for a B+ gun. I did change the stocks out on the Range Officer during the test; obviously if you follow this blog or my Instagram you saw the issues with had with the factory stocks and the foolishness of the previous owner. I actually really like the Magpul 1911 grips , they’re grippy without being too aggressive, and they have a huge thumb relief cut to make accessing the magazine release easier. Plus, they’re affordable. $15 is a pretty good price. One thing I did love about the Range Officer was how accurate it is. This gun shoots. 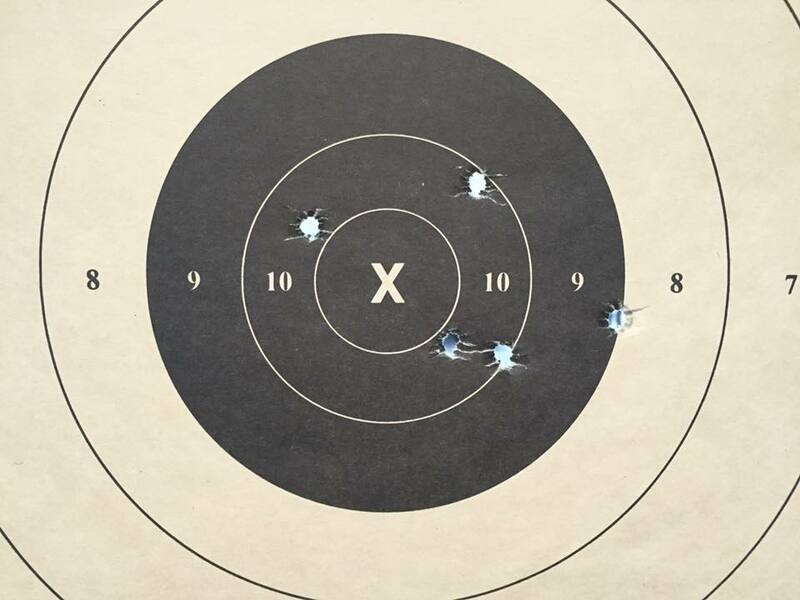 That’s a timed fire group (5 shots in 20 seconds) from the Range Officer, shot at 25 yards a B-8 target. The “black” of a B-8 is 5.5 inches, and with the exception of that one little flier in the 9, all of those are 10s in the much smaller circle. This gun shoots well. The only real criticism I have of it is the tendency towards light primer strikes with hard-primered ammo like Tula or Fiocchi, both of which I had issues with. The easiest way to solve that of course is not use that ammo with this gun, which is exactly what I’ll do moving forward. With some minor tweaks to the recoil system, and the addition of a magazine well, this would make a pretty solid choice for USPSA Single Stack, and might even be decent if I pressed into service as a Bianchi Cup gun. As it stands now, the Springfield Armory RO sits at a distance second place behind Tim’s Wilson Combat 9mm 1911, which scored a perfect 100/100 on our test. Up next is either the Armscor 1911 or the Dan Wesson, and to be honest I’m having trouble picking which one. S&W 1911 9mm needs to be in the mix! Test the cheap 1911s. Please. I already know that an expensive 1911 will run, and any 1911 made by a company that uses someone’s name is already too expensive for me. Expected a little more out of the gun, especially since it’s from Springfield. I’m with you, not that bad just expected better. Looking forward to your future reviews of 9mm 1911, especially the Colt which I understand is on your review list. A 9mm 1911 is on my short list of guns to purchase. I keep telling myself just breakdown and get a Wilson, but 3K is still a lot of money for a handgun. I know there is really no reason to have a 9mm 1911 other than wanting one. I’m sure my 9mm Glocks are a much better choice for almost everything and a lot easy to maintain. I’d love to see how my RIA Tactical Model matches up. If you do a review of the armscor will it be the single stack 9mm or the double stack? Single seems more practical to me, and more obtainable as I live in Cali. Ditto — I want to see how a Rock Island will do. The Rock Island would be interesting as well. Some of their higher end 1911s look pretty slick. I have been saving for a commander 9mm for carry (because come on, 1911s rule), and this series of articles has helped me decide at least how to test before I start carrying a new gun.